Expanded Realms 1: Treasures and Traps - Studio 9 Inc. 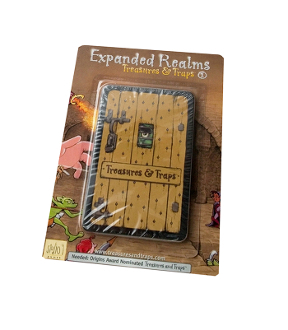 Expanded Realms is an expansion for the Award-Winning game "Treasures and Traps". Unlock more magic and mayhem on your quest for treasure. This expansion of "Best Card Game of the Year" nominee Treasures and Traps will enhance your adventure possibilities. Open the door to 12 new cards, 2 exciting play variations, and Class Cards that give you the chance to be one of 10 unique heroes with special abilities. You must have the Treasures and Traps card game to use this expansion. Designed and Illustrated by C. Aaron Kreader. Copyright © 2015-2019 Studio 9 Inc. All rights reserved.